New Zealand’s natural beauty is a major drawcard for international students wanting to study abroad. Lakes, rivers and beaches are among our country’s most popular attractions, all of which offer an inviting lifestyle for prospective students. 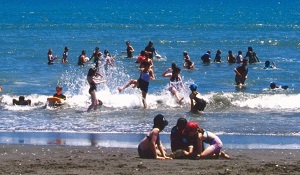 However, New Zealand’s unique waterways present potentially hazardous conditions for swimmers, and international students form a high-risk group for water injuries and drownings. The University of Waikato have recently launched a water safety programme with the aim of changing this statistic. Supported by Water Safety New Zealand, The University of Waikato have recruited international students to take part in the programme which will span across both semesters of 2019. The programme aims to empower the students with water safety awareness and give them the ability to protect themselves and others. Playing in and around water forms a big part of New Zealand’s national identity, but it is important to remember that overseas visitors may have had little or no experience swimming or simply being around different waterways. The programme will feature workshops based both in and out of the water where they will learn specific skills like; understanding hazardous environments, recognising emergencies, identifying and treating hypothermia, and how to make safe decisions. International students often form a tight-knit group during study, meaning the learned skills will not just benefit the individual but the entire community. Water Safety New Zealand is a proud supporter of this initiative from Waikato University, and we are committed to improving the wellbeing of New Zealand’s international students. Original generation time 1.8626 seconds. Cache Loaded in: 0.0395 seconds.